One of the perks of having toddler-aged children, is that we can finally start doing crafts! Granted, it takes a l-o-n-g time to do anything with so many helpers, but it's still fun to see them working so hard on their own special project. This is our first official craft, so it's extra special to us! I picked a day that my niece was over so that we could all do it together. Working with my two-year-old quadruplets + their 2-year-old cousin, made for a very exhausting morning. (God bless all you preschool teachers!) But, the kids were so proud when it was all done! 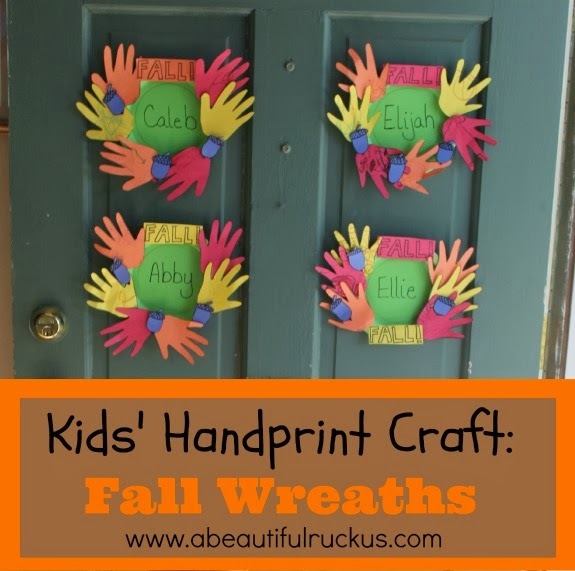 To make our Fall Handprint Wreaths, we started by tracing hands onto white paper. I used a pencil so that I could erase extra lines made while trying to hold wiggling hands still. 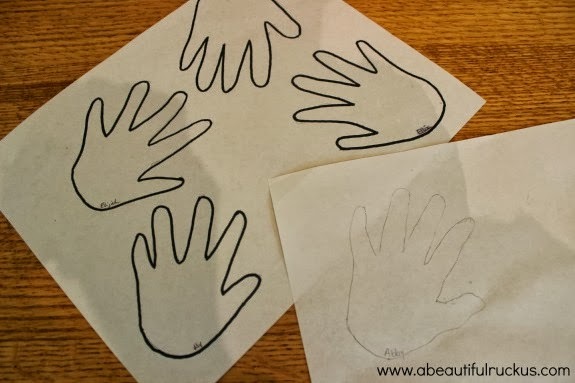 In the interest of maintaining sanity, I traced one hand per kid, went over the lines with a black sharpie, and then ran them through the copier six times. Can you imagine tracing hands 36 times?! Yikes! 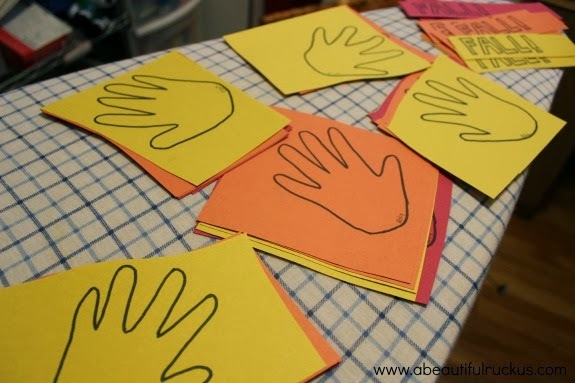 I ran the handprints through the copier six times using two sheets of each of the following colors: yellow, orange, and red. Pretty fall leaves are a must! Then I cut all of the hands apart leaving room to spare. 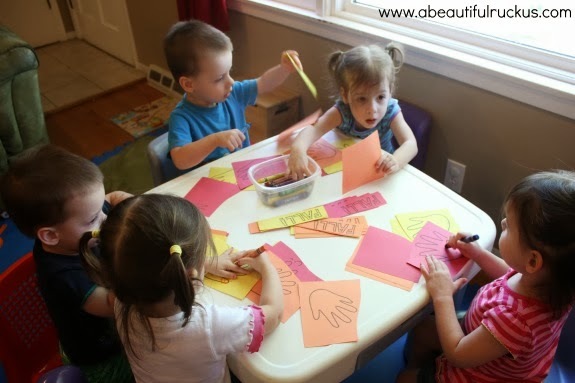 We then gathered around our little table, and each child was given his or her own stack of hands to color. 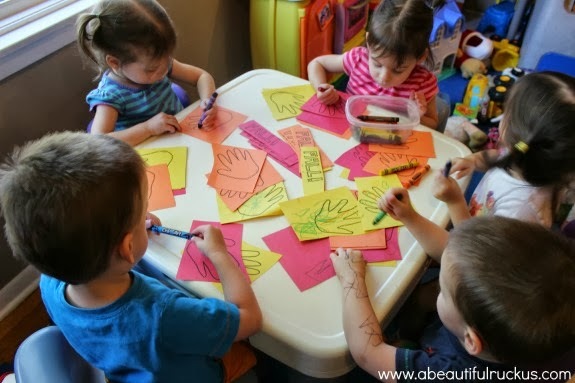 By the end of our coloring time, the hands were all mixed up, so that's another good reason to include names! Did you notice that Elijah found a ballpoint pen while I was making copies? He decided to decorate his arms and legs. Hehe! While the kids were coloring, I sat down to draw the acorns (no laughing at my drawing talent, please!). I went for the brown paper, but we didn't have any, so I settled for blue. We like to use our imaginations over here! Then we took a break for lunch, because coloring is hard work! While the kids ate, I cut out the 36 handprints and 18 acorns so that we would be ready to put everything together after nap time. I briefly toyed with the idea of using glue to put these together, but then I remembered that I was thinking of giving glue to five 2-year-olds. Uh, no. We went with tape instead! I took each child individually, and helped them put tape on the back of each of their pieces. Then we took a green paper plate (dessert size), and decorated it with our leaves and acorns plus a happy "Fall!" sign. 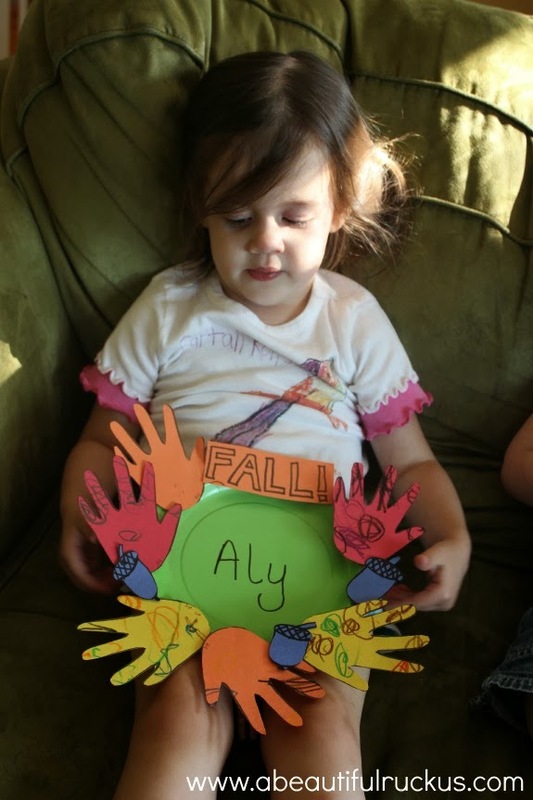 I hung our quadruplets' Fall Handprint Wreaths on our front door, and Cousin Aly took her wreath home to show her parents. My kids have repeatedly wandered over to the door to look at their wreaths since then. It's pretty cute! I will add this though: Make sure you hang your wreaths high enough that they can't be reached, otherwise your kids may want to disassemble them when you aren't looking. When did they get so tall?? 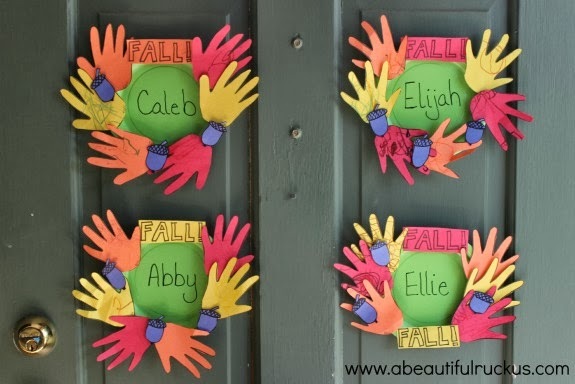 What are your favorite toddler fall crafts? We are excited to do another one soon! I wanted to write to you & tell you how much I love reading your blog :) You inspire me as a woman & mother! Your babies are so beautiful & have grown so much since I started reading! I was just looking at the pictures on this post, it's amazing how much Abby & Ellie look like Aly :) All very beautiful girls! 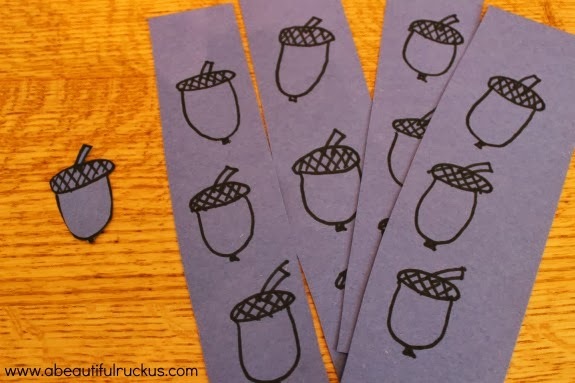 What a great little craft for the kids to make and have fun with! I love it! How did your comments for a cause end up for the month??? Great job! I am impressed...I would be intimidated to try this with just my two! It took a little longer than I thought it would, but it was fun! This looks like so much fun!! It's easy enough for even me to do with my kids. They'll love it. Thanks for sharing this idea. It looks like your kids had a blast doing it too. Love their creations. Thanks, Crystal! I hope your kids enjoy doing it as well! How cute!! I'm sure they loved doing this and being able to put their own special touches on it. You're much braver than I! So cute! And then they decided that they were too cute to leave on the door. Next time, I need to put them up higher on the door! Oh yes, isn't it fun now that they're old enough to really enjoy crafting? You have so many creative days in store ahead of you! Thanks for sharing on our page this weekend! I'm really excited for this next phase of childhood! Bring on the crafts! Oh, they came out so wonderfully!! Thank you for sharing at Sharing Saturday! !